The move to use fewer agencies does not mean a decline in media spend, its top marketer tells Gideon Spanier. Unilever is at the start of a bold experiment. The world’s second-biggest advertiser with an €8bn annual budget is cutting half of the 3,000 agencies that it uses around the world and making 30% fewer ads and marketing assets. "It’s a live project right now," Keith Weed, chief marketing and communications officer, says. "Only some agencies have been spoken to." The cuts, which were announced by Unilever’s board in April, are meant to save €1bn by 2019. That message went down well with investors as the Anglo-Dutch giant is under pressure to boost profits after rejecting Kraft Heinz’s takeover bid. However, Weed is adamant that Unilever, owner of brands such as Ben & Jerry’s, Domestos, Dove, Hellmann’s and Surf, remains committed to investing in marketing and will reinvest savings in the group. "People need to care about what you’re talking about. There’s a real premium on getting people’s attention in a cluttered world"
The efficiency drive is about producing fewer ads because Unilever hasn’t been sweating them hard enough – or wearing them out, as Weed puts it. This is not about investing less on media to distribute those ads, it’s about showing a smaller number of ads for longer, he says. "There are no plans to decrease our media [spend] this year," Weed declares, explaining that the headlines in April about a 30% drop in the number of ads led some people to wrongly think that Unilever was planning a 30% cut to its budget. Despite Weed’s insistence, industry sources say there is some evidence that Unilever has trimmed its media spend in recent months. He says: "Our general approach is we really believe in building our brands through marketing investment and we don’t have a strategy of reducing that investment. Go back to 2009, when a lot of companies reduced their BMI [brand and marketing investment] – we didn’t. We increased it." 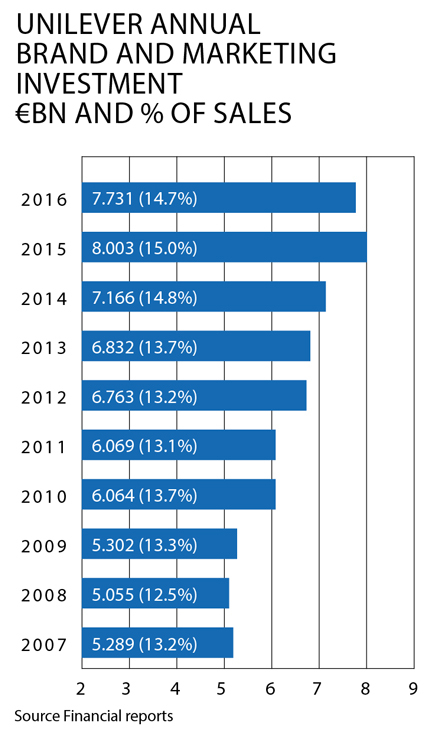 Unilever’s marketing spend has risen steadily from about €5bn a year in 2008 – apart from a small drop last year. That’s a cumulative increase of €12bn. As a percentage of sales, BMI has risen from 12.5% to nearly 15%. The company plans to spend €7.5bn on BMI in each of the next four years. Weed, talking to Campaign in Uni-lever House, the company’s grand Art Deco headquarters overlooking the Thames, believes there is a strong rationale for making fewer ads. "What keeps me awake at night is brand fragmentation," he says, explaining how he has seen the number of media channels proliferate and fragment over the past decade. This left him feeling that Unilever was "developing too many assets" and needed more "consistent" messaging. However, he needed to prove his case to the board. "It’s a big call," Weed admits. So his team created a "wear-out" tool to measure the effectiveness and efficiency of Unilever’s marketing assets. That involved checking whether an ad had been seen enough times by the target audience and if it had reached a point where it was no longer effective in driving awareness or other brand metrics. Weed’s team found that a tiny proportion – just over 1% – of Unilever’s ads "wore out". Worse, about 60% of its ads did not even "wear in" as not enough of the target audience had seen them. The creative execution is key – regardless of whether it appears on TV, social media or another channel. "The biggest variable is the quality of the creative," he maintains. "Creative quality beats the media mix." His team found Unilever’s best- performing work focused on sustain-ability and social purpose, such as Dove’s "Campaign for real beauty". "People need to care about what you’re talking about," Weed says. "There’s a real premium on getting people’s attention in a cluttered world." That is also why many of Unilever’s brands – Lux is an example – are working with online influencers on YouTube and elsewhere because they "can talk to hundreds of thousands of people in this connected world", Weed adds, stressing the importance of marketing "in real time, in the culture". Reducing the number of agencies will mean there are winners as well as losers, as some will pick up more work while others are dropped, he says. Several leading creative shops are already said to have seen 30-40% drops in fees from Unilever in the past few months. While that looks drastic, some are supportive. 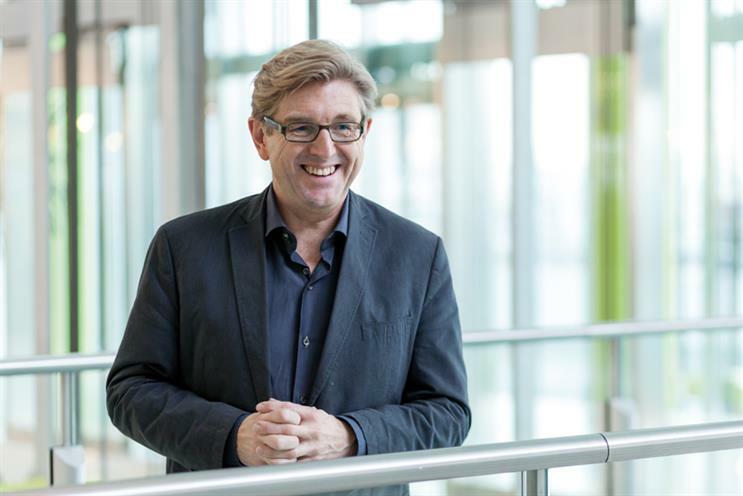 One UK agency boss says: "There’s been a lack of discipline in the way Unilever works. They’ve been missing out on building long-term brand equity." A global agency chief says: "It is genuinely about avoiding waste. They are being responsible and intelligent and trying to avoid cutting into muscle." Weed is keen to praise his lead creative shops, which include Bartle Bogle Hegarty, DDB, J Walter Thompson, MullenLowe and Ogilvy & Mather, and notes Unilever’s relationship with some of them goes back decades. Mindshare and PHD share most of the media duties globally. Using fewer agencies is part of a broader strategy of simplification globally and locally. For the past decade, Unilever has had two marketing teams – brand developers and brand builders, each employing their own agencies – but now they are coming together in one group. Weed thinks Unilever’s marketing needs to be more agile, which is why it is taking some functions in-house. As a trained engineer, data "is closest to my heart", so he has beefed up the data management team – he calls it "a people data centre". Agencies that hope to keep winning Unilever business must show they can handle data responsibly, Weed says. He launched U-Studio last year to make creative content but feels vindicated about not in-housing programmatic because of its complexity, adding that some other brands are "walking away" from it. Weed has spent the past couple of years warning about "the three Vs" (viewability, verification and value) and is "pleased" that others are now "being more vocal" – a hint that he was talking about problems in the digital media supply chain long before others such as Marc Pritchard, his counterpart at Procter & Gamble, spoke out. He plans to return to "the three Vs" at Cannes Lions. In an age of data-driven mobile marketing, where it’s possible to know a huge amount about each consumer’s habits, "media and media planning are becoming much more important", Weed says: "The focus used to be all around the creative and [decisions about] the media at the end. Now, the media and creative go hand-in-hand." That means agencies must work more closely because the ad industry’s split approach "has got far too complex and needs to be simplified", he explains. "This is absolutely about how we make our advertising work better in today’s world to build our brands."